This was supposed to be a Tropical Crumble with mangoes and bananas, but like I mentioned when I made jam, I have apricots and plums up the wazoo right now. 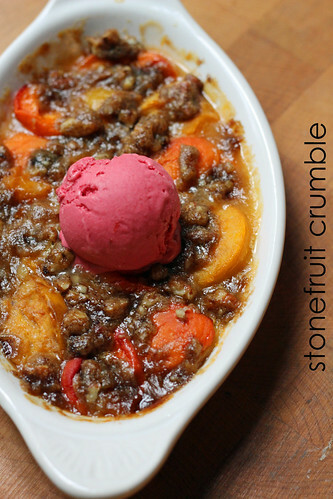 So this became a Stonefruit Crumble instead, with apricots and yellow plums (look, I kept the colors similar! ), and a little red plum ice cream for good measure. I tried to keep my version along the same lines as the original, flavoring the fruit with ginger and citrus, but since my fruits were small and soft, I didn’t pre-cook my filling before baking the crumble and I added a sprinkling of flour to the fruit mix to help thicken the juices. Does anyone know if theree’s technically a difference between a crisp and a crumble?? Maybe there is, because my topping wasn’t as crunchy as I thought it would be. It had pecans, brown sugar and butter (cut back from the original recipe by a couple of tablespoons), so it wasn’t bad, but it did just kind of meld into the smooshiness of the baked fruit. For the recipe, see Baking: From My Home to Yours by Dorie Greenspan or read Laws of the Kitchen, as it was Gaye’s turn to pick again. Don’t forget to check out the TWD Blogroll! What fun! …and a seemingly good result too. Im currently falling over backwards with the lemons from my tree. Guess I too need to get my innovative cap on. beautiful colors from your stone fruit! This looks devine Steph – and adore the red plum icecream on top. Thanks for baking with me this week! to answer your question – yes, I normally use a vegetable peeler. I usually have to do two layers to get enough of skin off, but I find it’s less wasteful than using a knife. I was wondering about the crisp and crumble question too. Your version looks fantastic, especially with the red plum ice cream on top! The way the fruit was cooked with the brown sugar, I’m sure that this would be good with any fruits! Yours looks great. I used pineapple and mango which was a winning combination. Your crumble looks lovely! Good idea to use stone fruit while it’s available – the season passes way to quickly. Im sorry I had to miss this one, it looks great! That’s a great-looking crumble – of course it’s better to use what’s good and seasonal, right? And the plum ice cream is incredible – such color!